This is his first posting after the University, and he admits that he is better at blowing things up than healing. Even though, his services are still appreciated, so Gan carries out his duties as well as he can. He is something of a night owl and doesn't go to bed before 6am in the morning. He will sleep in the southern-most room in the Lords Manor until noon. At that time, he leaves the Castle and treats himself to some Skyrim cuisine down at the Jerall View Inn. At 2pm, he heads back to the castle, enters the Lords Manor and wanders around for two hours. At 4pm, he once again leaves the castle, this time to take a stroll in the northeastern part of town. 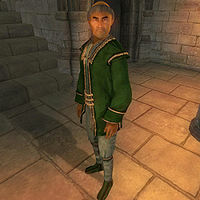 At 7pm, he visits fellow healer Cirroc in the Chapel Hall underneath the Great Chapel of Talos. He returns to the castle at 10pm, eats a late dinner in the Great Hall and then enters the Lords Manor for a long night of wandering.